﻿ Florida Snake Photograph 007 - I actually caught this Yellow Rat Snake in an attic! 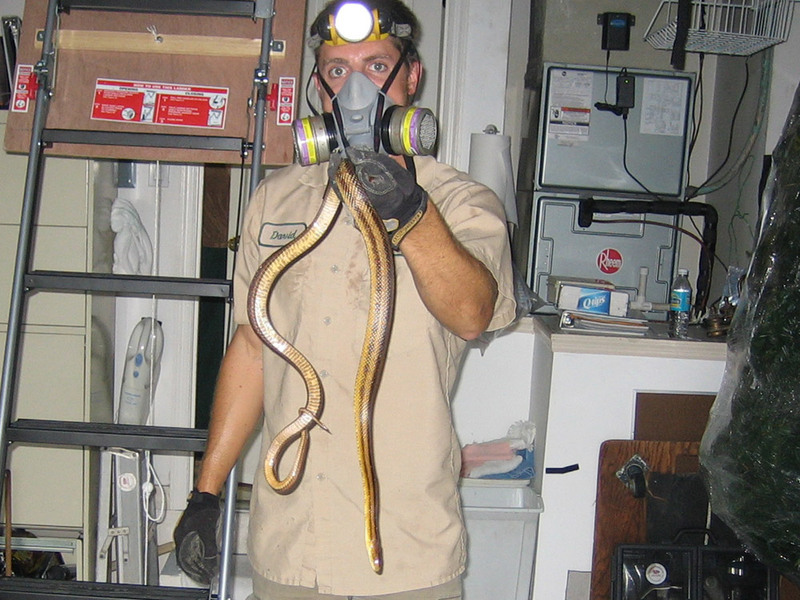 I actually caught this Yellow Rat Snake in an attic! DESCRIPTION: A yellow snake with brown or black stripes down the length of its body. The juveniles look nothing like the adults - they look like gray tree bark. Yellow rat snakes are found all across the Florida peninsula. The yellow rat snake is non-venomous species that can grow up to 6 feet long. They can be somewhat yellow, orange or green, and often have four brown stripes going from head to tail. The young are somewhat white on the underside of the head and the body is blotchy. As their name implies, they love to eat rats as well as mice. They are also known to frequent chicken coops to eat eggs, giving them the nickname of “chicken snake”. Other animals they eat include squirrels and birds. Yellow rat snakes are easy to care for and are often recommended as the first snake you will want as a pet. They need an enclosure that will readily accommodate their size and allow them to move around. The bottom of the enclosure should include some things like unbleached paper towels, aspen shavings, snake safe mulch, or bark. You will need to give them a space to curl up in that fits their entire size. They love to climb, so place a shelf or branches for their comfort and some exercise. Keep a light shining into the enclosure for heat, but do not let it dry out. Humidity in their habitat needs to be 40 to 60%. To feed your yellow rat snake you can get frozen mice and thaw them, or get live mice from your local pet store. Juveniles need to be fed a couple of times a week while adults can go up to two weeks between feedings. It is smart to feed them in an area separate from their enclosure to ensure they do not associate your hand with food if you try to get them out. If you choose to feed your snake live rodents, you need to stay with them. Sometimes they can severely injure the snake.